Perfect for parties and Bento box! Slice white Kamaboko about 1cm thick. Make a cut on the top. 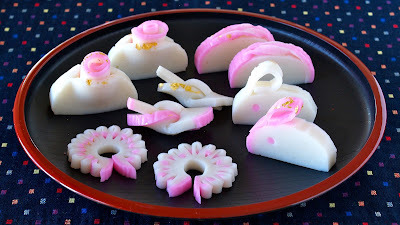 Make 3 ultrathin slices of pink Kamaboko, layer, then roll. Place it in the white Kamaboko. Slice pink Kamaboko about 1cm thick. Peel the pink part leaving about 2cm of the end. Cut off 1cm of the end of the peel and cut out the eye using a straw. Cut out the eye of the white part and insert the pink eye. Slice the peel into half then roll to make the ears. Slice Kamaboko about 5mm thick. Make a cut in the center, then make staggered cut half way through on both sides. Put both sides through the hole in the center in the opposite direction. Pull to make the not. Slice Kamaboko about 1cm thick. Peel the pink part leaving about 2cm of the end. Make 2cm cut in the center. Put the end through the hole. Slice Kamaboko about 5mm thick. Make 2mm slices leaving 5mm of the ends. Fold each in the same direction.